The profession of medicine is predicated upon an ethical mandate: first do no harm. However, critics charge that the medical profession’s culture and its public health mission are being undermined by the pharmaceutical industry’s wide-ranging influence. In this article, we analyze how drug firms influence psychiatric taxonomy and treatment guidelines such that these resources may serve commercial rather than public health interests. 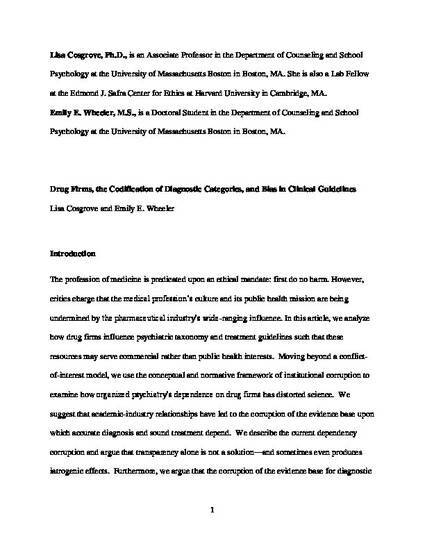 Moving beyond a conflict-of-interest model, we use the conceptual and normative framework of institutional corruption to examine how organized psychiatry’s dependence on drug firms has distorted science. We suggest that academic-industry relationships have led to the corruption of the evidence base upon which accurate diagnosis and sound treatment depend. We describe the current dependency corruption and argue that transparency alone is not a solution – and sometimes even produces iatrogenic effects. Furthermore, we argue that the corruption of the evidence base for diagnostic and practice guidelines renders obsolete the traditional informed consent process, and we offer suggestions for reforming this process. Post-print, pre-published version of article published in The Journal of Law, Medicine & Ethics, Volume 41, Issue 3, Pages 644–653, Fall 2013: http://onlinelibrary.wiley.com/doi/10.1111/jlme.12074/abstract. © 2013 American Society of Law, Medicine & Ethics, Inc.